Posted by Jonathan Bird on Wednesday, December 05, 2012. Back in 2010, the Blue World team headed down to Small Hope Bay Lodge on Andros, Bahamas to do a segment on Blue Holes. 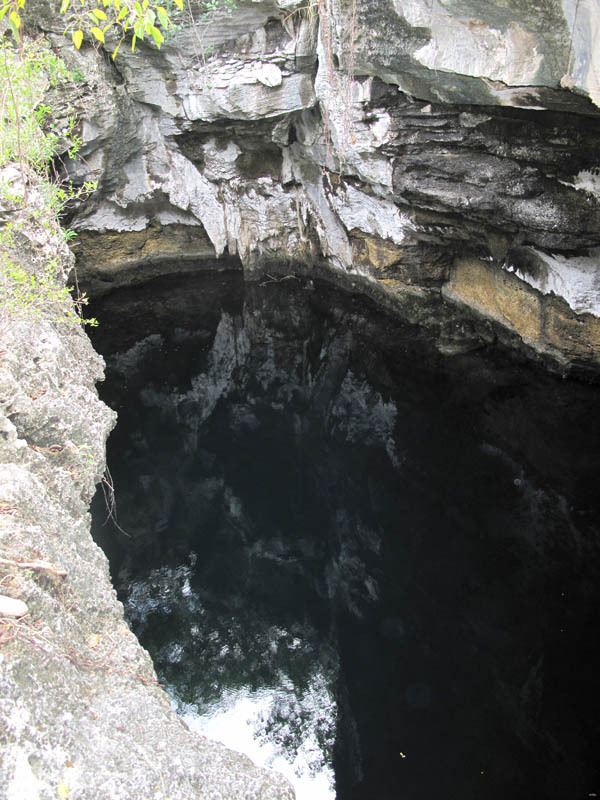 We dove The Guardian, one of the Blue Holes near the resort. While we were there, we learned about another blue hole, called Stargate, that was a little more difficult to dive, but more spectacular. 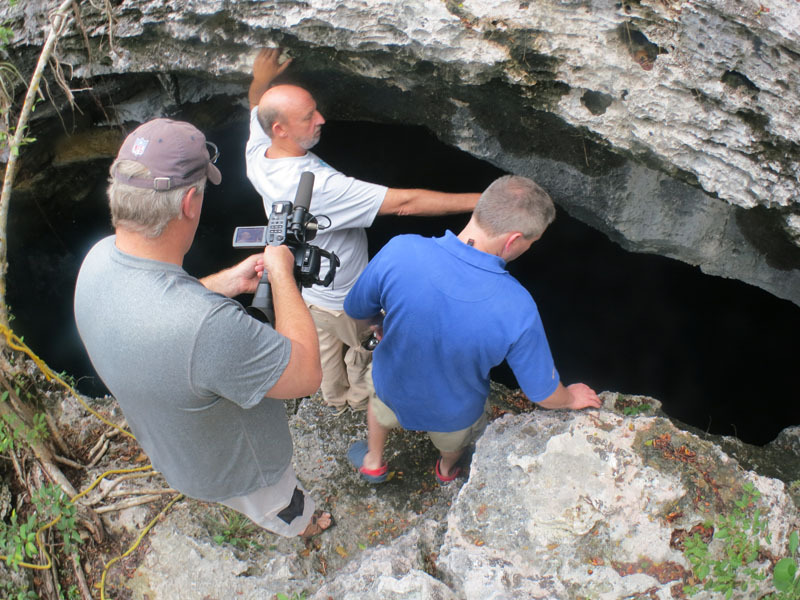 Then I saw a picture of Stargate in National Geographic magazine, by my friend Wes Skiles, (one of the world’s most renown cave photographers) and knew we had to go back to Andros! Fortunately, Jeff Birch, the owner of Small Hope Bay Lodge was happy to take us to Stargate. So we arranged another visit to this laid-back island and cozy resort, for a super adventure! 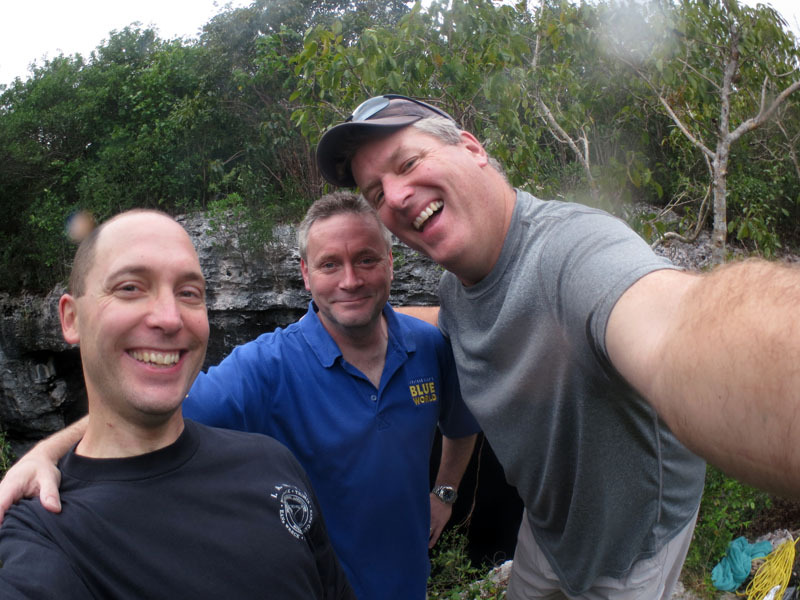 Todd (our resident technical cave diver), Cameraman Tim and I have been looking forward to this adventure for a while. When we arrived at Small Hope Bay Lodge, Jeff met us and his first words were “Jonathan Bird comes, and the wind comes!” It seems to be true. The last time we were here it was windy as well. (And raining!) Fortunately for us, the wind only interferes with ocean diving, not underground diving. 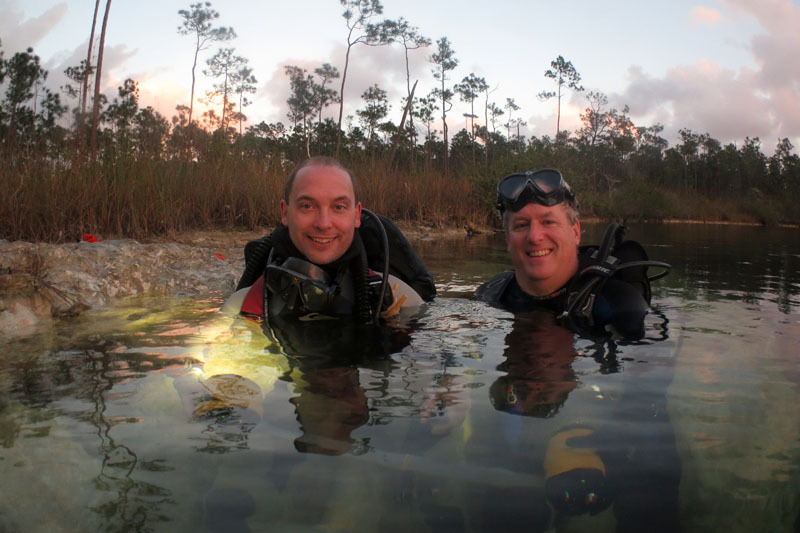 The next day, we planned an excursion to a local blue hole known as Cousteau’s Blue Hole so we could get our weight worked out, and try out a bunch of special LED cinema lights we had brought, made by Atlantis Light Systems (part of Boulder Engineering). These are very high-powered lights that we would use to light up the huge north passage in Stargate. 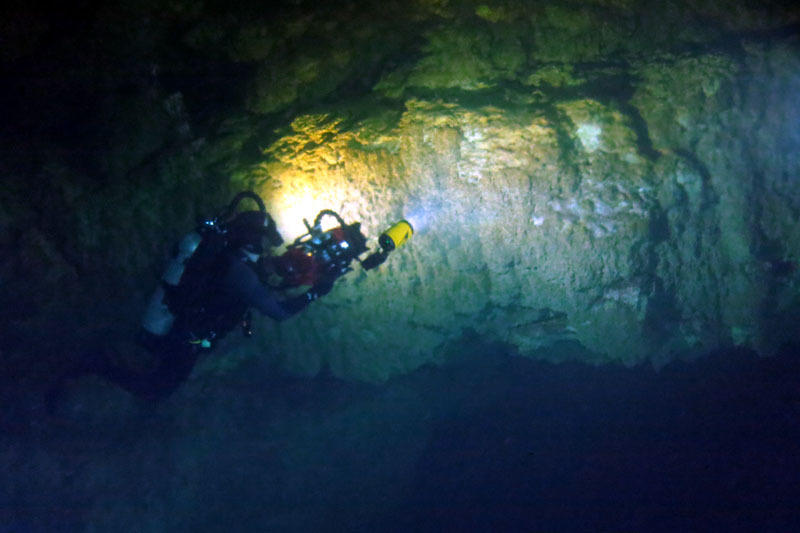 Cousteau’s Blue Hole isn’t really a cave system, just a hole in the ground that is a mere 400+ feet deep. It has an overhang all the way around at a depth of about 50 feet that makes the diameter of the hole about double what it appears at the surface. The check-out dive went well. 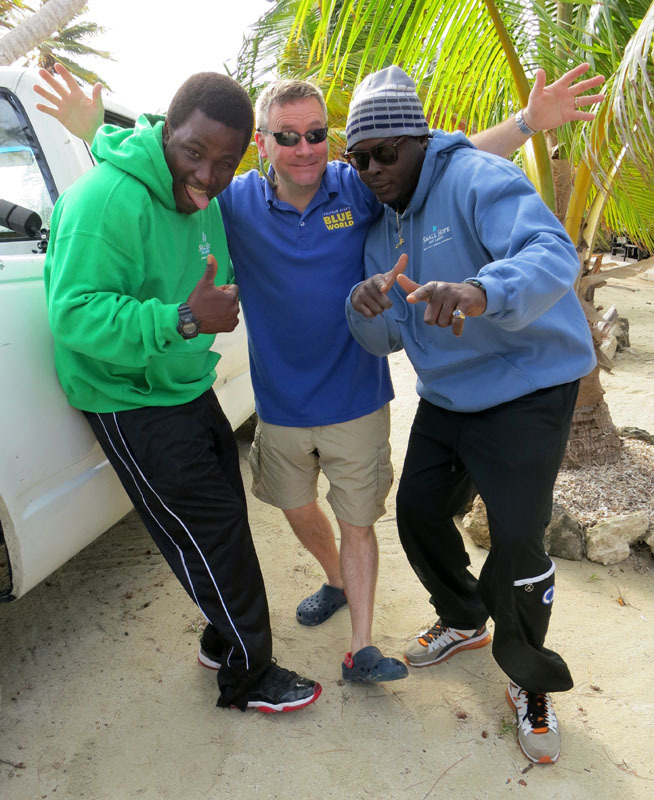 We were led by Dennis, one of Small Hope Bay Lodge’s divemasters. We substituted a big video light for his little flashlight and told him to light up the wall. Instantly, he became a member of our lighting team! 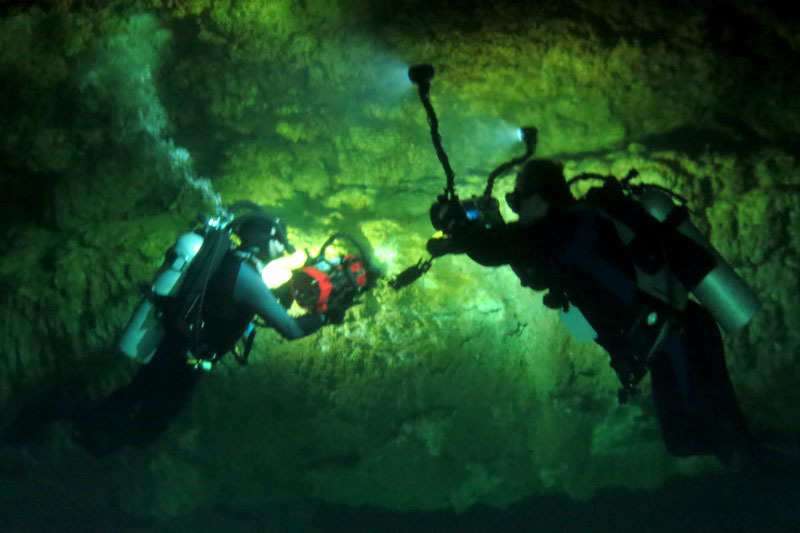 It was very dark in Cousteau’s Blue Hole as the surface waters are green and murky, with a pretty clear halocline starting at about 50 feet and heading down to about 80 feet. After that the water gets dark. We’re told that past 140 feet, the water gets very clear, but we had no need to go that deep to test gear. All the lights worked as expected and we planned on doing our cave shoot the following day. Since Small Hope Bay Lodge is on Central Andros and Stargate is down in South Andros, we would have to fly down there. There are no bridges between the two islands even though they are quite close together. Jeff would fly us down in his Cessna 172. Now you need to understand that if you run a dive operation on an island as remote as Andros, you pretty much need a plane. Jeff grew up on this island when his dad started the resort back in the 1960s and has spent his whole life flying around. He has been flying for 47 years! We had a lot of gear, so we would need to make two trips down south with the plane. We removed the back seats to make room for gear. 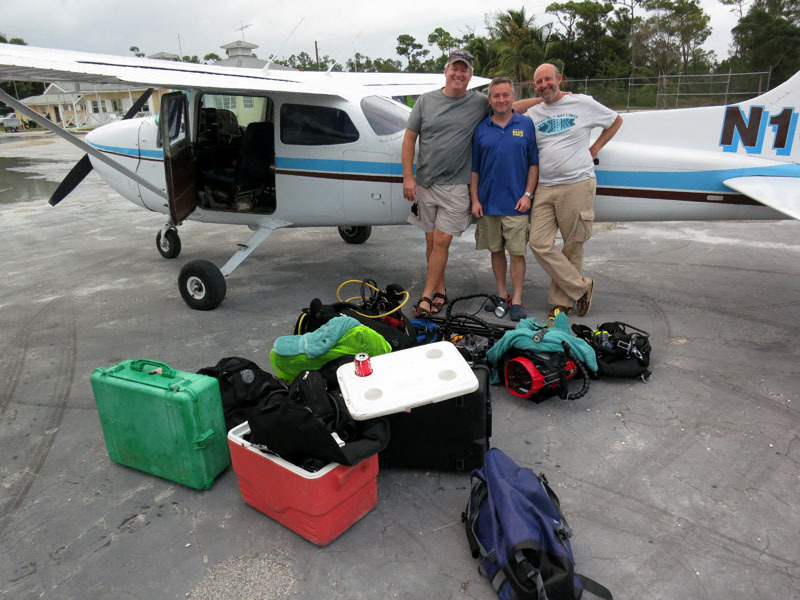 Jeff and Tim flew to South Andros with the heavy scuba gear in the back. Todd and I filmed the plane taking off, while Tim filmed the flight from inside the plane. Then Jeff returned for Todd and me. We brought the cameras and lights with us on the second flight. 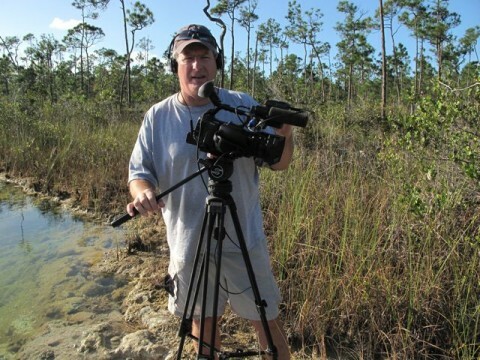 Tim filmed us landing at South Andros. It worked out great. What was also great was the giant rain storm we flew through on the way. It didn’t faze Jeff in the slightest. He was flying along, navigating in zero visibility while rain pounded the windshield. I filmed the whole thing with a GoPro because too much mist was coming around the side windows to risk a pro camera. We could make a whole adventure segment just out of that flight! 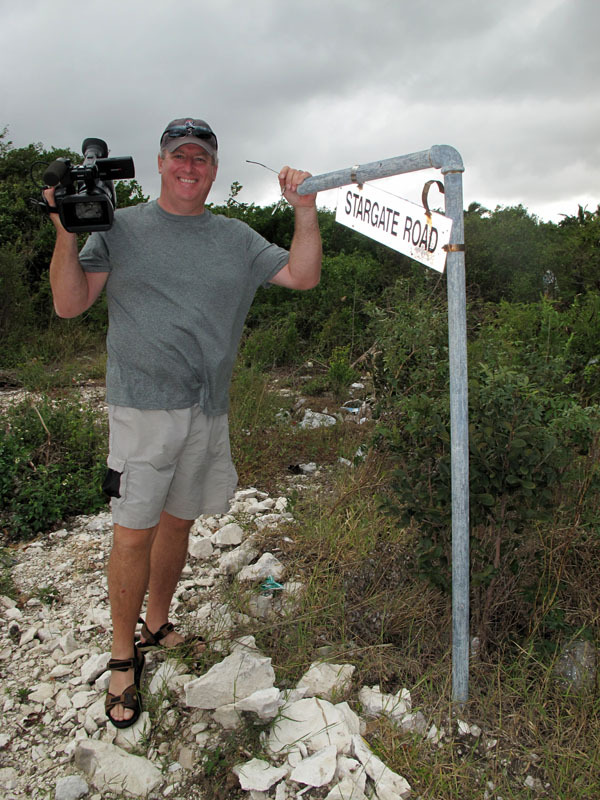 Once we landed in South Andros, Jeff called his favorite local taxi and we were delivered to Stargate, the entrance to which is only about a hundred foot walk from the road. We were also met by Josh, a local helper Jeff employs for dives in Stargate. Josh was a big help, carrying tanks and gear to the entrance of Stargate, lowering gear down inside, and hauling it back up. The entrance to Stargate is a hole in the ground with the water level about 20 feet below the edge. To get in, you just do a giant stride and fall. Waaaaaay down. You have time on the way down to contemplate whether or not this was a good idea and how much it is going to hurt when you hit the water. Fortunately, 20 feet seems a lot higher than it is. The water entry was a piece of cake. Once everyone made it to the water, Josh lowered the cameras down on a rope. Then, we checked our gear and submerged. Jeff led us down through a layer of hydrogen sulfide, through a giant crack in the wall at 60 feet and further down into a giant tunnel which comprises the north passage. Up front, leading the team, Jeff had one of our big lights. 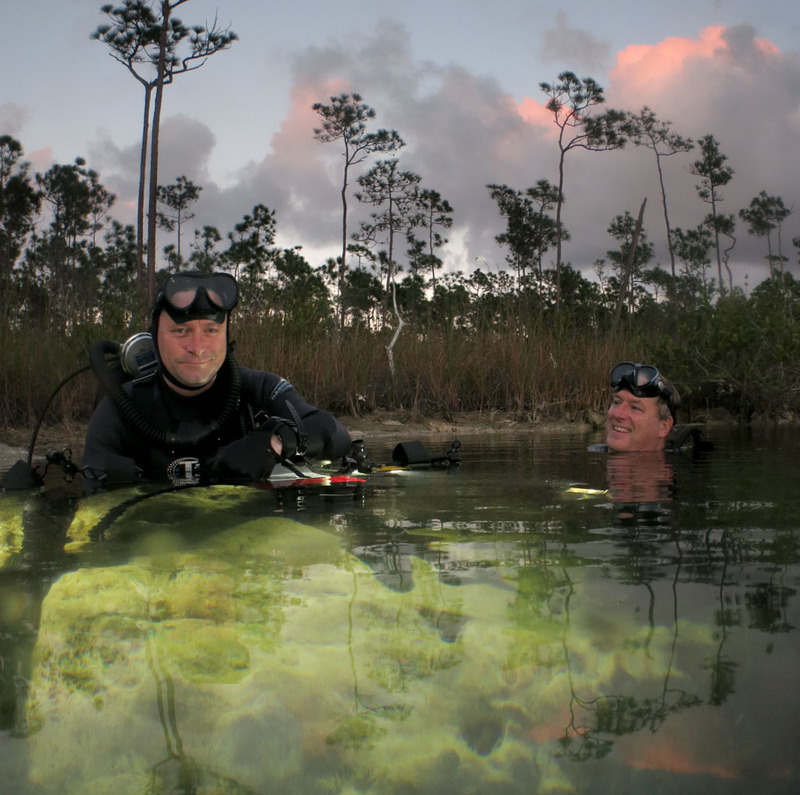 Todd came behind him with a pair of the big Atlantis lights mounted on a bar. Cameraman Tim and I alternated bringing up the rear of the group, each camera outfitted with another pair of Atlantis lights. We lit that place up for a good 75 feet all around, and the view blew my mind! It can only be described a surreal and beautiful. I can only hope the video does it justice. After swimming along for about 10 minutes, we reached the end of the grand north passage, so we turned and headed back. By now our bubbles had hit the ceiling and created some raining silt. The viz was not terribly reduced, but the beautiful wide scene was filled with little particles, so I turned my attention to closer shots of the ornamentation on the walls. In particular, the walls are filled with flowstone formations. These form when the cave is dry and water drips from above, depositing limestone into formations that look like candle wax. Jeff pointed out one large, thin formation that could be backlit. It was so thin in fact that light came though, like a lampshade. Todd used one of the big video lights to backlight it for me on camera. Gorgeous! 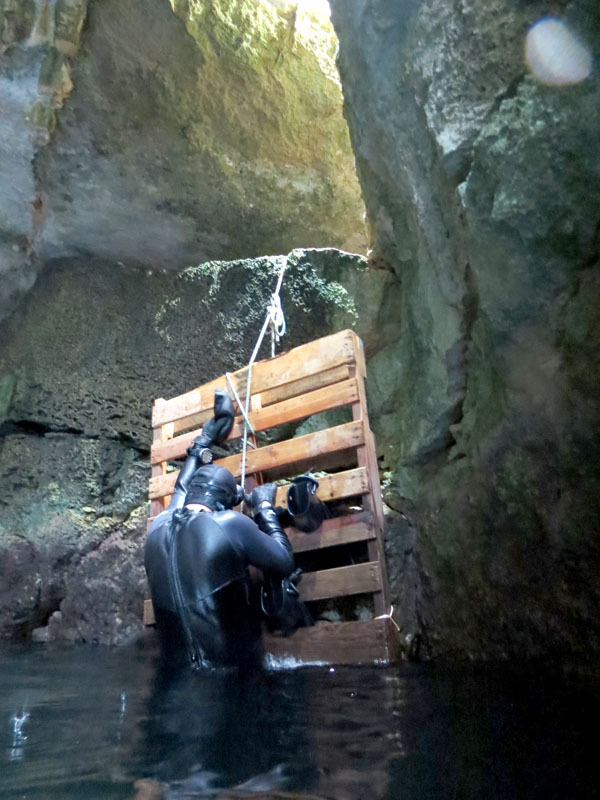 When we emerged from the cave at the end of the dive, in addition to being speechless at the beauty of the thing, we had the task of getting the cameras and scuba gear raised back up by rope. Without a tank, you can climb out. They have hung a wooden pallet on the side of the cliff by a rope, which gets you up to the first landing. From there, you just have to crawl. No big deal. Because we had gone into about 10 minutes of decompression, our bodies were saturated with nitrogen by the end of the dive. Our flight home needed to be low. And Jeff doesn’t kid around when he flies low. We never went above 200 feet altitude on the way home. In fact, it seemed like we just skimmed the top of the waves for the whole flight. That little Cessna is a heck of a tough little plane. I have a lot of respect for those workhorses now. As I write this, I am sitting at the Lodge, waiting for the taxi to take me back to the airport and home. 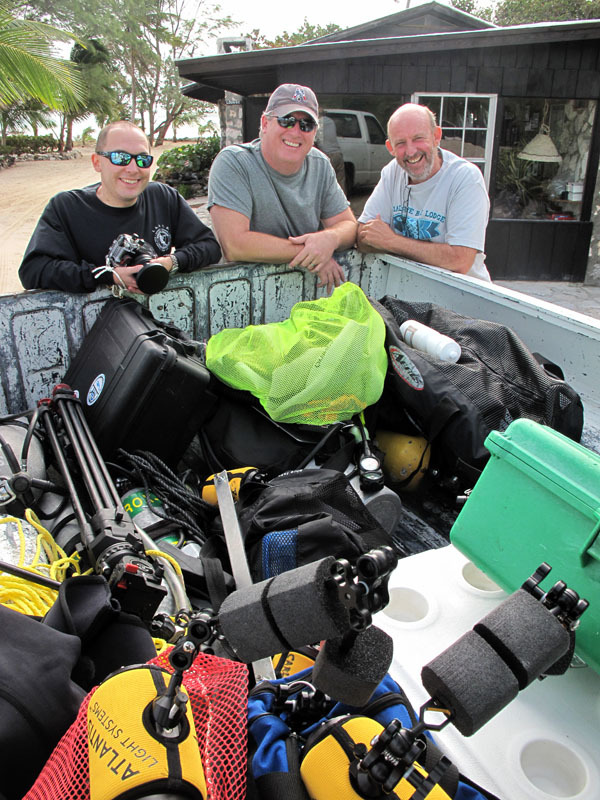 I can hardly wait to get started editing this segment, and already I’m thinking about my next trip back to Andros to visit my friends at Small Hope Bay Lodge for some incredible diving adventures!